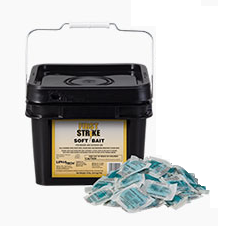 FirstStrike soft bait gives you the assurance that you’re always using the best rodenticide possible. This soft bait rodenticide is designed for the quality-minded PMP. It is highly effective with excellent palatability. The most technologically advanced rodenticide on the market containing difethialone, which was invented and patented by Liphatech, is formulated at 25 PPM. High acceptance by rodents, even when competing food is available. Effective for the most challenging rodent control problems.